The Planetary Diet - could you live by it? 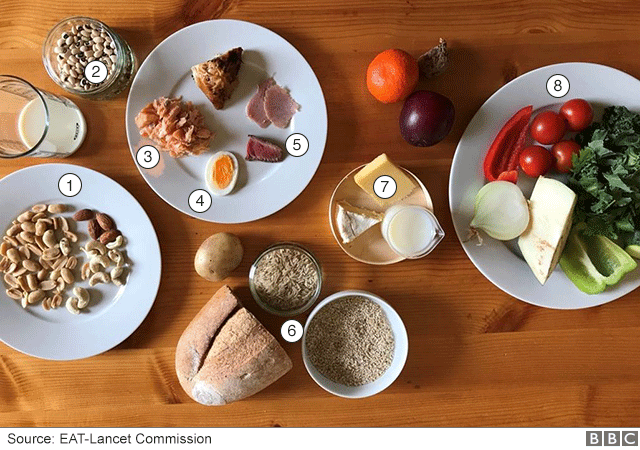 Yesterday, scientists launched a revolutionary diet, dubbed the Planetary Diet, which promises to be healthier for humans than our current diet, and to be better and more sustainable for the planet. I don't normally post Facebook links, but in this case it's incredibly instructive to have a look at a project that a group called Avantgardens did a couple of years ago. They got families from 27 different countries to put together their typical groceries for a week, and photographed the results. What the World Eats - Families with their weekly stash of food. American photographer Peter Menzel and writer Faith D’Aluisio have traveled the world documenting that most basic of human behaviors—what we eat. Their project, “Hungry Planet,” depicts everything that an average family consumes in a given week—and what it costs. The comparison is staggering. And in light of the new, proposed Planetary Diet, perhaps we need to radically rethink our diets.